Our programme was co-created with learners and tutors. Our after-school sessions offer a range of services including academic tutoring, psycho-social support, career guidance, and lots more. The core of our programme is tutoring. 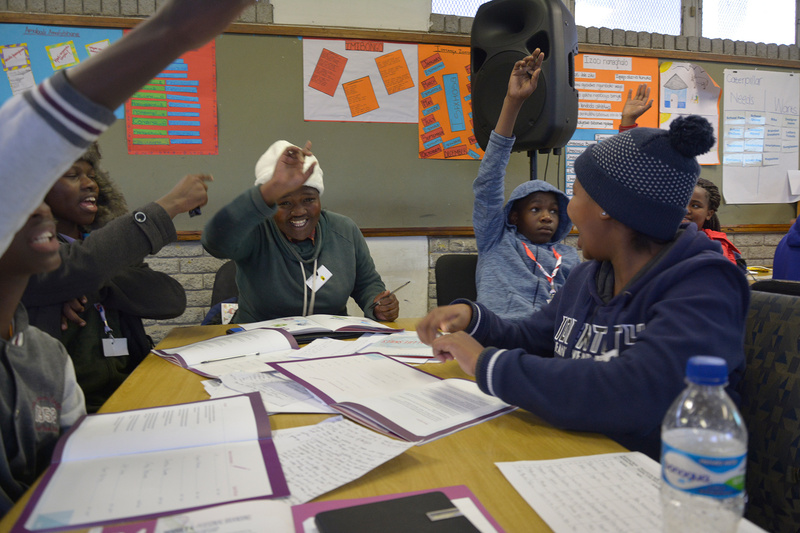 Volunteer tutors support learners in small groups to ensure that they understand their school work. Our army of superhero volunteers come from a range of backgrounds, but most are studying at university or college, and many of them are our alumni. In Grade 12, we ensure learners apply to at least three post-school opportunities, so they enroll in tertiary institutions, learnerships or jobs the following year, so they have somewhere to go when they finish school. When these learners have their matric results, we then make sure that they are actually placed in a post-school opportunity. But, most of all IkamvaYouth is HOME to learners who often come from difficult environments, and when they enter the doors of IkamvaYouth they feel noticed and valued. At IkamvaYouth, learners are validated and celebrated for who they are. If you join our programme, you will find someone who will believe in you, hold you accountable and ensure you reach your fullest potential. To join our programme there are no academic requirements for entry and participation is free of charge. However, in order to keep your place in the programme, you need to meet the attendance requirements.